John McCann was still sleeping when the phone rang. A rookie fireman with Engine 255 in Brooklyn, he'd worked the night before, and the 11th was his day off. It was McCann's mother on the phone. She told him to turn on the television. Not long afterward--following calls to his parents and his girlfriend, Christina Keough '01, a nurse in Boston--McCann was on a bus filled with firemen crossing the Manhattan Bridge. Both World Trade Center towers had fallen, and "you couldn't see Lower Manhattan because of the smoke, but you could see fighter jets over the city," says McCann, a native of Manhasset, Long Island. When the men of Engine 255 got to ground zero around noon, they were told to wait for further instructions. "We were just standing there for a while," says McCann, "and all around us was mayhem." Ash and soot made it hard to breathe. McCann saw firetrucks "smashed and twisted like toys." Soon, he says, the company decided standing around wasn't what they'd come for. He and a few others helped move a massive crane through the rubble-strewn streets--clearing concrete, then dragging the crane a few feet behind a truck. When a third Trade Center building fell, they had to run from it. Reports through the day of gas-main explosions kept everyone alert. McCann finally went back to the firehouse around 1 a.m. He tried to fall asleep in his bunk. But he couldn't manage it. "I was so antsy to get back down there," he says. He worked 130 hours a week. 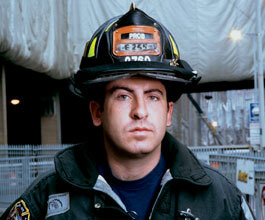 Some days were spent at ground zero, others at the firehouse in case regular, everyday fires broke out in Brooklyn. One day, as he and his company were sifting through the wreckage of the south tower, someone pulled a keychain out of the concrete and dust. It said "World Trade Center" on it, and the firefighters realized they were standing in what had once been the gift shop of the observation deck, 107 stories up in the sky. One man who gave his life on September 11 was McCann's best friend from the fire academy, Jim Pappageorge of Engine 23, a Manhattan company that lost five of its 25 men. "We sat in the last row in class and I was on the end of that row," says McCann. "No one was on the other side of me--just him. That's the hard part."